Bailey and Pooge excitedly hit the trail in Prosser Creek, Truckee. The sun is shining, the birds are chirping, and the trails are begging for dogs to be taken for a hike. North Lake Tahoe has no shortage of fun treks with varying difficulty levels so adventurers can explore the local terrain for 30 minutes or three hours; whatever terrain suits you, the trail system is your oyster. Wilderness First Aid for Your Dog trainers, Mike Krueger and Dr. Amanda Stuart, remind people that it’s important to first plan on the makings of a successful and safe trip. “I have a few basic requirements for summer hiking with my dog here in Tahoe,” Krueger explained. Understanding the difficulty of the hike’s terrain in comparison to the human and pup’s stamina. Packing hydration and snacks, and making frequent stops along the way for comfort. Keeping a close eye on the dog so they don’t overheat — another reason to be sure they are well hydrated. Bringing a doggy first aid kit to quickly address any bumps, bites and scrapes that might happen along the way. Once the essentials are organized, it’s time to pick your trail. Below are the Tahoe Top Five suggestions for any kid of dog and owner to get outside, take in the fresh mountain air and burn off some energy. Krueger opts for the Pacific Crest Trail between Sugar Bowl and Boreal. “It’s a great round trip that provides access to three lakes; Lake Angela, Flora Lake, and Azalea Lake with numerous little ponds and streams along the way. 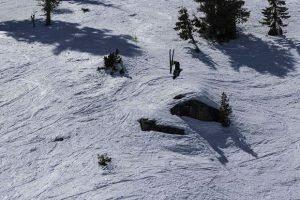 You can start the hike from across the street from the old ASI building at Sugar Bowl, or from the Donner Summit CA snopark,” he explained. 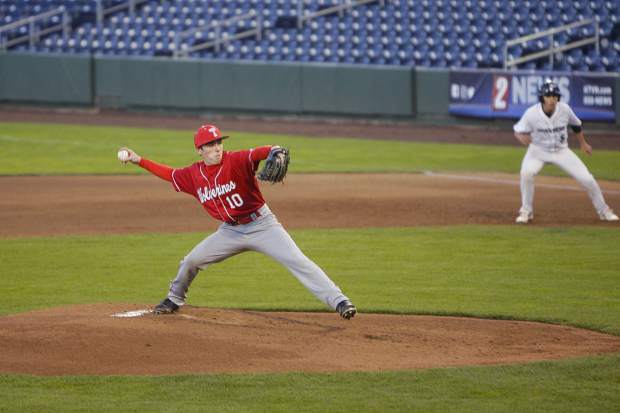 Krueger shared his knowledge of another fantastic option for those looking to get out of town a bit. “Another place which provides a number of great hikes is the Lakes Basin Recreation Area, which is 9 miles southwest of Graeagle and about a 50-minute drive from Truckee. There are over 20 natural glacial lakes, most of which are accessible by well-maintained hiking trails,” he said. 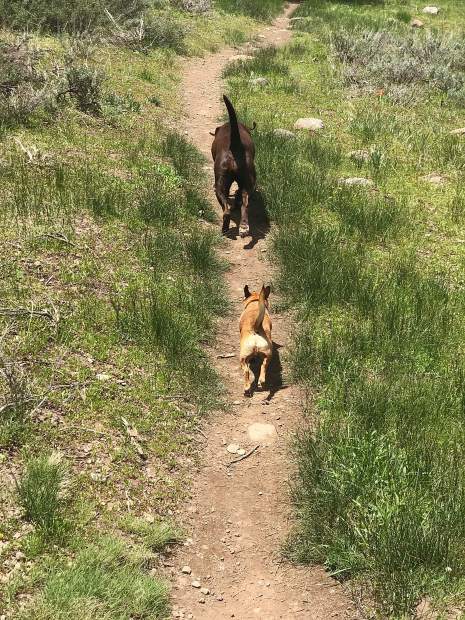 Local veterinarian, Dr. Amanda Stuart shared two of her favorite trails to take the pups. “If you are in shape for it, I love both 5Lakes or Shirley Canyon,” she said. Alpenglow Sports first introduced the Wilderness First Aid for Dogs class during their summer mountain festival; it’s safe to say they love dogs. They shared their tips on taking your furry friends to the Meeks Creek Trail out of Meeks Bay. Parking at Meeks Bay, hikers should take the Meeks Creek trail toward Lake Genevieve (it is about 4.5 miles to the lake). Anyone looking for a longer hike can turn left there, and then continue to Crag Lake, Stony Ridge Lake, and beyond. 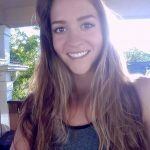 “I love this hike because there is plenty of water for dogs to drink and romp, and owners can choose their own distance, whether that is just a mile out and back up Meeks Creek, or all the way out to Crag Lake, Rubicon Lake or Phipps Lake, which can make it up to 18 miles round-trip,” said Emily Burke of Alpenglow Sports. She added that taking a right at Lake Genevieve instead of left toward the other lakes, the trail will take you out to the Pacific Crest Trail, which is also a great hike. Those planning to go into Desolation Wilderness (the wilderness boundary is about 2.5 miles from the Meeks Bay parking area) will need to pick up a day-use permit at the trailhead (no reservations are required unless you’re staying overnight). Sam Kieckhefer, public relations coordinator at Squaw Valley Alpine Meadows covered just about every degree of difficulty in his suggestions for Squaw’s best dog friendly hikes. He suggests for the moderate hiker a trek up Shirley Canyon to High Camp, saying that guests should be sure and add in some extra time for a dip in the pool and a bite at Poolside Café before downloading the Aerial Tram at the end of their fun day. 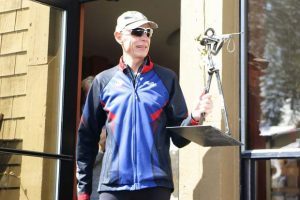 For a difficult hike, Kieckhefer says explorers and their four-legged friends should take the Aerial Tram to High Camp and hike out to Granite Peak and the Pacific Crest Trail. For even more of a challenge, a bonus hike, if you will, connect the two trails together. Stephanie Myers, Northstar California Resort communications specialist, said that pups on a leash are welcome on any of the resort’s hiking trails and complimentary guided hikes. 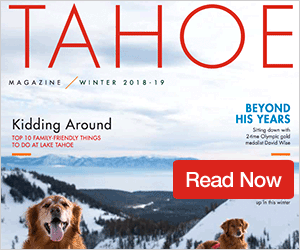 “Dogs can experience the same lift-served access by riding the Big Springs Gondola and the Tahoe Zephyr Express Gondola to take in new smells without the uphill climb,” she added. Myers also recommends planning ahead for yourself and your companion. “On the trail, we recommend packing water for both our human and furry guests. At the bottom of the trail, the Lodge at Big Springs provides shade and beverages for post-hike relaxing,” she said. Wherever you choose, hiking with your dogs will always be a wonderful adventure and a great workout for everyone.